Within a short stretch of coast on the very northern tip of Jutland, there are three lighthouses. Two are decommissioned, the third is still active. They are a remarkable glimpse into the development of the lighthouse in Denmark. This first picture is of the Skagen's vippefyr (or 'lever light') which is a copy of the lighthouse that guided ships around the tip of Jutland from 1627 to 1747. It was the first of its kind and replaced an earlier system - a parrot light. This new design allowed the burning coals to be hoisted into the air, clearly visible to passing ships, contained in a metal basket, thus reducing the risk of setting the wooden structure alight. 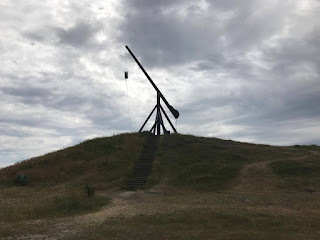 This was one of three of a kind that marked the shipping channel from the North Sea down into the Baltic - an important but treacherous route for Danish vessels, especially in the days of sail. This one defintely has a quaint, olde worlde look to it. 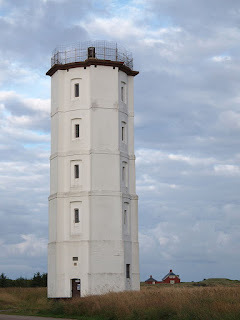 The white lighthouse served Skagen from 1747 to 1858. 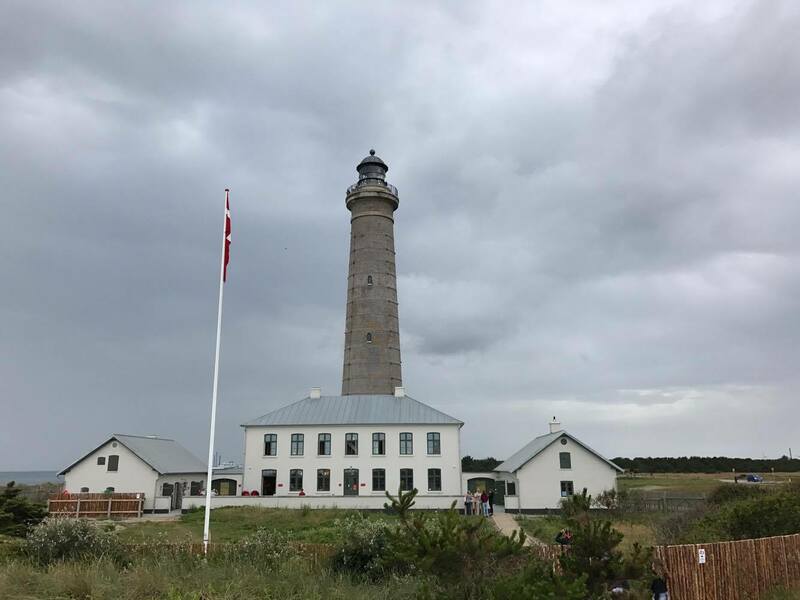 The first Danish lighthouse to be built of stone, it was originally red brick until it was whitewashed at the beginning of the 19th century. It must have originally had another name! Initially coal fired, rapeseed oil was later burned. 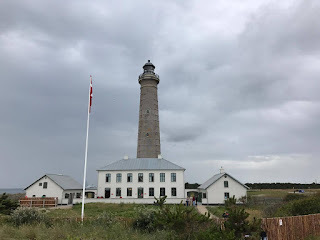 The third lighthouse on this small peninsula is the Skagen Lighthouse, also known as the Grey Lighthouse (Skagen fyr; det grå fyr). This lighthouse came into use in 1858 and is still in use. It is impossible to tell from the photographs, of course, but at 46 metres tall, it is more than twice the height of its predecessor. The original parafin lamp was replaced by a 1,000 watt and then a 1,500 watt sodium lamp. It's not difficult to imagine the progress towards safety at sea that these developments must have made over the years. Having seen an old chart of shipwrecks clustered at the tip of Jutland, I know how necessary that was. What is fascinating at Skagen, is having these three very different lighthouses from different eras all in view at once; testament to the importance of warning ships of the dangers of the peninsula through the centuries and to people's continual striving to improve the system for doing so. Incidentally, the Skagen lighthouse is now also home to a migratory bird reserve with hides and an interactive museum inside. An excellent double use for the building. Fascinating to see the way lighthouses developed. I had no idea the early ones were like the first one. How lonely they all look! Very interesting and informative. I too was fascinated to see what early lighthouses looked like. Did the Romans actually have them, though? Rosemary Sutcliffe certainly thought so.